In Stranger than Fiction, Ferrell stars as Harold Crick, an IRS agent who does everything to a set routine, all set by his ultra reliable watch. One day though something changes and suddenly Crick can hear a narrator (Emma Thompson) talking about his life. As with anyone this freaks him out a little and causes him to seek help. Only instead of trying the methods proposed by a psychiatrist, he turns instead to a literature professor, Jules Hilbert (Dustin Hoffman), who tries to help him determine what sort of story he seems to be in. While the narrator, a published author, continues to struggle with how to finish her latest novel and in particular the death of her lead character, Harold Crick. 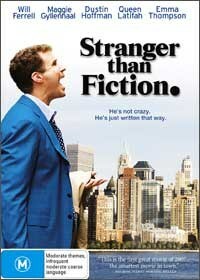 Featuring some great performances by will Ferrell, Emma Thompson and Maggie Gyllenhaal, Stranger than Fiction is a cleverly directed drama/comedy by Marc Foster, however Ferrell does not really suit the role of the straight man in this film. The video quality is outstanding and is presented in an aspect ratio of 16:9 with true Dolby Digital 5.1 surround sound for that cinematic experience. When it comes to extras, this disc has quite a bit that include interviews, deleted scene and behind the scenes featurettes.